Undeniably the place that serves the best wings in town, the newly opened Wings Bar at Clarke Quay serves up food (and wings), American style. With a menu loaded with stuff from ribs to wings with blue cheese dip, this place couldn't get any better for people who want real food. I would recommend to go with an empty stomach given their wide selection of items on the menu, which will leave you thinking at first, and wanting more later. By the way, the wings on their signage does not refer to (chicken) wings. 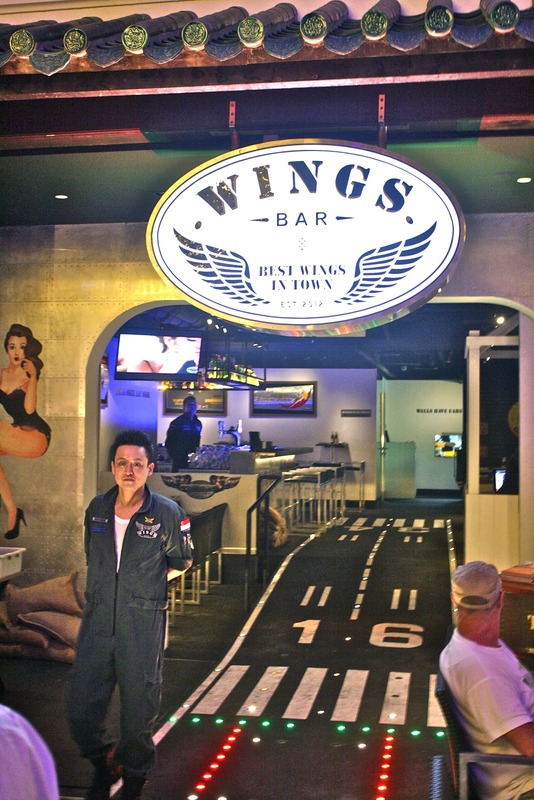 Instead, Wings Bar is aviation themed, which also explains the interior decor (which looks a bit like a plane runway to me), as well as the suits the waiters and waitress are wearing. Overall outlook? I say 10/10. Apart from the aviation themed decor, their menu, as well as utensils are specially designed to the theme. Napkin with logo, checked. Wet tissue with what looks like aviation packaging, checked. I cannot fault this place for ambience, especially when they are located just at the fountain in the middle of Clarke Quay. We took off with the Caesar Salad with Chicken. A good start i must admit, no one can fault fresh greens evenly coated with creamy and light dressing. Alongside the romaine lettuce were fresh crispy golden croutons, huge crispy bacon pieces, chicken and shaved parmesan. There was nothing to complain about since it was salad, and yes because they do things the American way at Wings Bar, the portion was huge. I recommend two to share if you are venturing into other stuff on the menu. Because you cannot go to an American restaurant and not try their ribs, we decided to go for half a rack of their Signature Ribs. The meat was tender like how perfectly cooked ribs should be, and the sauce was a little tangy and spicy at the same time. Served with coleslaw, which has bacon on top, as well as pecans in it, a little odd but both my partner and me enjoyed it. I also understand that the coleslaw is only made when there is an order, which also means it is fresh, and does not come from a pre-made huge tub left sitting in the fridge. Going to Wings Bar and not having any wings is like going to a theme park and not going on the roller coaster. Their menu features 10 different kind of wings, which also means you will find at least one that suits your palate. The B-52 - Original Buffalo wings were a bit of a disappointment as i was expecting rich barbecued flavored wings, but instead they were tangy and spicy. However, when accompanied with the blue cheese sauce (which comes with celery and carrot sticks with every order of wings), it came off pretty good. The Flying Tiger, which is spicy sichuan sauce tasted a bit like a less spicy version of Rendang (an all time Malay favorite spice). I found it a bit too spicy for my liking but my partner polished it off. My favorite wings had to be the Japanese Zero. Terriyaki marinated wings with a crispy glaze and sprinkled with sesame seeds. There was nothing to not love about the wings, given it wasn't spicy at all. It was sweet, yet not overly sweet. For people who do not like spicy food, i say go for this. The Thai Afterburner wasn't as spicy as The Flying Tiger, probably because of the ingredients used - sweet chili, garlic, basil and lemongrass. If you are expecting something like tom yum, you will be surprised to know it does not taste like that. The flavors were infused and marinated into the wings and each bite was flavorful. I had to keep this for the last after warning from the staff there. This is the ultimate as you can probably decipher from the photo. The Spitfire is the hottest wings served at Wings Bar. Blended chili padi (or some say small chili) and marinated into the wings, i highly do not recommend this if you have low tolerance for spicy food. But if you are with a group of friends, it's worth an order just to see who hangs in there longer. In all, Wings Bar serves up good food for decent prices. Also, centrally located at Clarke Quay means it is easily accessible. They open till quite late so whether you are out partying, or if you have that sudden crave for wings, you know where to go. Love this site! Wings really does look like a great bar, I'll have to have a try next time I'm in Singapore! Thanks for the review Nicholas, helps people like me decipher what is good in Clark Quay!